Gear driven automatic slicer with slice counter. 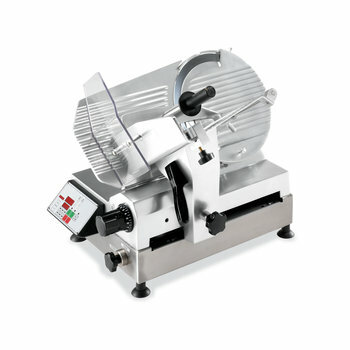 Slicer Fully made of high-polished aluminium protected against anodic oxidation. Professional slicer with ring and blade removal tool. Two independent motors for blade and carriage. Adjustable carriage run to adapt to different product sizes. Professional slicer with ring, carriage lock and blade removal tool. Carriage mounted on life-lubricated bearings.